Math Magic: Chicago math-rockers make elaborate yet accessible tunes. The four artsy esquires comprising Maps & Atlases are bent on revolutionizing music, or at least making something fresh. And that’s refreshing in itself. The foursome met as art students at Columbia College Chicago, but the band wasn’t a real priority until graduation rolled around. Now, freshly degreed, they bring the joy of collegial overachievement to their sound, and it’s no surprise they’re geeky. “Within our instruments, we are obsessive about our parts ... interesting but not overstepping each other—probably because we’ve been playing together for so long,” says drummer Chris Hainey by phone. Like his bandmates, he’s continually experimenting, adding new instruments and textures, calculating sound like it was Honors Calculus II. Rhythmically jaw-dropping with atypical time signatures and finger-tapped fretwork on the guitars, so-called “math-rock” took root in the Midwest in bands like Shellac and Rapeman, with Steve Albini (a member of both those bands) a major figurehead. 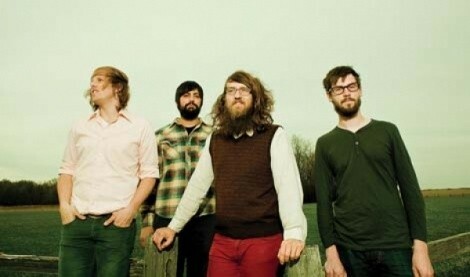 Traces of this movement are evident in Maps & Atlases’ sound. “We definitely started with a math-rock-oriented sound,” Hainey says. “We wanted to play complicated, technical music, but we also wanted to maintain a pop-oriented sound.” Math-rock roots and all, this is a band capable of capturing an array of brilliant soundscapes. City Weekly connected with Hainey on the release day, June 29, of their first full-length album, Perch Patchwork. While new ears might hear traces of Animal Collective, TV on the Radio or even Vampire Weekend, M&A’s sound is distinct. The recording process was new for the band, straying away from recording songs exactly as they’re played live, as they’ve done on past EPs. The first single, “Solid Ground,” is a clear example of lush layers played over a simple format; other tunes offer strings, reeds, marching drums and more. After some studio improvisation and tinkering, they’d turn over everything to producer Jason Cupp for the mixing and mastering. One concern for their tour was how the additional layers would be performed live by the four-piece. “It’s been a challenge. We have a pretty good hold on how to translate everything. We’ve never had to do that before: interpret a piece of music into a live music setting,” Hainey says. They’ve discussed a potential need for sampling, but no one has ever even used pedals, so the idea seems foreign. Hainey says everything sounds full live without the strings and horns, and many of those melodies are translated onto the guitar or the accordion, demonstrating once again the band’s versatility as mathematic musical magicians.